8-Outlet Office Series SurgeMaster Surge Protector offers three-line AC surge protection for your mid-level computers, peripherals, phone/fax, DSL/cable modems and more. Surge protection includes 1-in, 2-out RJ11 telephone/fax. 3550 Joule energy rating provides maximum protection of all your sensitive electronic devices. Surge protector filters EMI/RFI noise up to 58 dB reduction. Design includes four AC block space outlets, right-angle plug, detachable cable management and sliding safety covers. 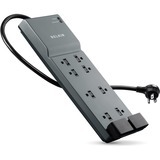 6' power cord delivers optimal, safe AC power through a 14-gauge, heavy-duty cord.